Japanese manufacturer Triode Corporation, owner of Tri brand name is another, along with Leben and Oyaide, Japanese brand that I feel attached to bit more than to others. I feel like (regardless if that is the right or wrong feeling) its Godfather. 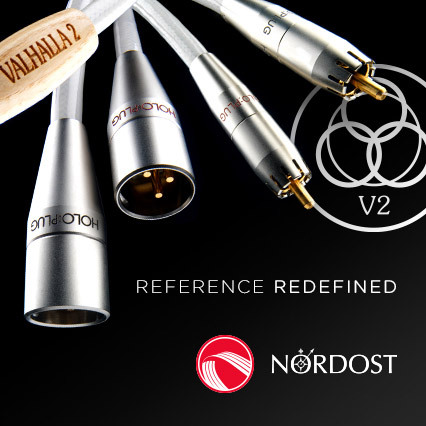 Its product was presented for the first time in Poland and possibly also in Europe in „High Fidelity”, in particular in memorable issue called Made in Japan of September 2006 (No. 29). It was its Polish and probably also Europe's premiere. We had received the device directly from Japan from Mr Junichiro Yamazaki, owner and chief designer of Triode Corp. Along with this first review we had conducted also an interview with Mr Yamazaki – let me encourage you to read it if you haven't so far - HERE. This time we have decided to take a look at sort of „basic” model, or in other words „classic” because of its design and tubes used. 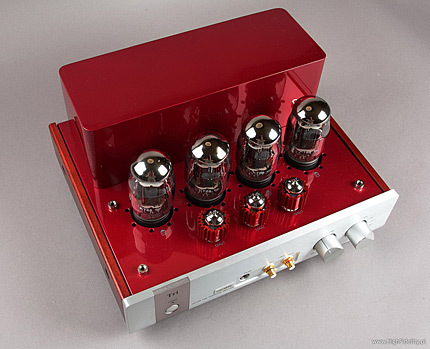 It is TRV-88SE with double triode 12AX7 at the input, two 12AU7 in phase reverse and working as drivers for power tubes - KT88. Power tubes work in classic push-pull configuration, in AB class, but they are working as triodes – kind of obligation if the company's name is Triode Corp. 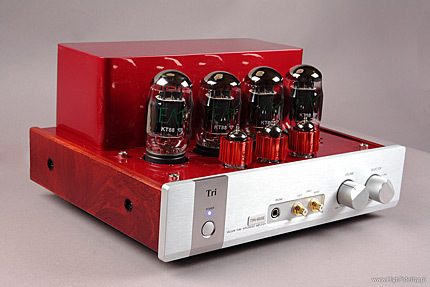 In my opinion all the tubes and also the enclosure are made in China. How else would it be possible to offer such price for Japanese product? I don't see any other way to achieve that – you have to look for savings somewhere. All the assembly, most passive elements, transformers come from Japan and very nice speaker's binding posts are made in USA. Audition was conducted in three stages – first was simple connection of amplifier to the speakers, second – device working as headphone amplifier and finally I rolled some tubes – both power and input tubes – I used the best I had at hand: KT88 from EAT – matched quarter from Diamond line and ECC803 with CoolDamper. The latter were used also for drivers. Diary of Dreams, Freak Perfume, Accesion Records, EFA 03647-2, CD. Stockfisch Records. Closer To The Music vol. , Stockfisch Records, SFR 357.4009.2, SACD/CD. Mark Knopfler, The Trawlerman’s Song EP, Mercury Records, 9870986, CD. The Beatles, 09.09.09 Sampler, EMI Records, Promo CD, 2 x CD; review HERE. ELO, Time, Epic/Sony Music Direct (Japan), MHCP-1161, CD. Martin L. Gore, Counterfeit2, Mute, 247725, CCD. e.s.t., Viaticum, ACT Music+Vision, ACT 6001-2, 2 x CD; review HERE. Ariel Ramirez, Misa Criolla, Navidad Nuestra, José Carreras, Philips/Lasting Impression Music, LIM K2HD 040, silver-CD; review HERE. Hot Piano, featuring Mr. Marty Paich, Tampa Records/Muzak, MZCS-1178, CD. As mentioned before I feel somehow connected to TRI. It is not that I am deeply in love (to continue this emotional language) but there is a small, warm spot in my heart reserved for it. Tri Corp created a great example – TRV-88SE to show how a manufacturer can reach out to Customers, adopt to budget limitations an so on, without sacrifying music. Already first few minutes spent listening to this amp will tell you it doesn't even try to sound neutral. We could always dispute what “neutral” means – is it a non-emotional “accuracy” of the sound?, or maybe rather to make an impression of live performance – which surely involves emotions? Anyhow some elements are common for both definitions and that is what I understand as “neutral”. Japanese amplifier offers warm, very rich sound. Its dynamics is attenuated so there is no chance for big band or orchestra to sound in a proper way. I mean it sounds properly if you consider richness and power but not the timbre. That could be easily verified when listening to Misa Criolla that was recorded in a big church. The size of its interior was only slightly marked and the distances between listener and chorus and José Carreras were almost the same. So I wouldn't count on ultra-precise presentation of interiors acoustics. But Tri has a virtue common among good devices (the ones that can catch you attention, intrigue you) – you don't want to change the CD, you don't feel like looking for some other recording that would better fit this device. As mentioned before – one of the methods of reaching to the customer is “seducing” him. 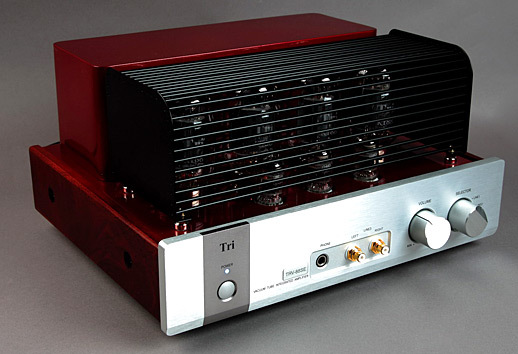 The review hereby amplifier does it by offering warm sound and softening of the attack. So everything we hear is very … “human”, fitted exactly to what we need to hear. Listening to more and more recordings with real pleasure I didn't “lack” anything. Yes, I could still hear what is described above but it absolutely wasn't disturbing. It was clearly showed by amazing record - Hot Piano. Featuring Marty Paich. It is an old recording with leading role of a piano, which was shown by Tri in a very accurate manner. The strike was bit softened but with long-lasting, full, rich and really nice sound . Pace in every recording was very good which is quite surprising considering not that great overall dynamics. But that great pace made me stay with electronic music for much longer than planned. For such music pace and rhythm and strike are substantial – you can't listen to electronic music without them because even the most interesting compositions would sound simply boring. I started with Counterfeit2 by Martina L. Gore. This particular recording comes from the “dark age” of EMI – time when they used copy-protection from company Cactus, the very one that hadn't stopped anybody from coping even one record but in most cases diminished sound quality significantly. Gore’s recording is no exception but in very good systems you have a chance to still “extract” music from it – with slow rhythm, mood and something more than just sounds. Tri is not a high-end device – it is relatively inexpensive amplifier but it played this CD amazingly well. Some irritating treble “spikes” and nervousness in the mid-range were still there but I simply knew that it was the recording not amplifier responsible and additionally I have some kind of allergic reaction for these particular flaws of sound. When I tried just to listen to the music without analyzing it, just feel the mood - I could do it without a problem. There was rhythm, depth, strong bass. My feeling was the same with the next recording - Freak Perfume by my favorite post-Gothic, post-DM (Dependent Mode), German band Diary of Dreams. Also here I was surprised positively by bass, but also by ability to present the depth and coherency of the sound.